We are a traditional thatched 17th Century family run pub in Ilfracombe, North Devon. Serving real ales, fine wines and delicious food using the finest locally sourced ingredients and seasonal produce. Inside we offer a warm, cosy and inviting authentic pub atmosphere. Serving a rotating selection of cask ales, fine wines and spirits. Our menu reflects the best of traditional pub food, ever changing to make the most of the finest locally sourced ingredients and seasonal produce. Outside we have a spacious, sunny and secure garden with views down the valley towards the Bristol Channel and Wales. Perfect for drinking, dining and soaking up the sun on those lazy summer days. On Sunday’s we serve our legendary ‘proper’ Sunday Roast, your choice of Exmoor beef, pork belly, chicken or vegetarian, rosemary roasted potatoes with a selection of seasonal vegetables and gravy. Served from 12:00pm to 3:00pm. If you are looking for something a little more private why not book our al fresco dining deck ‘Gyspy Terrace’, perfect for groups of ten or more. Food on the terrace is served family sharing style, creating the perfect environment to relax and socialise whatever the occasion. 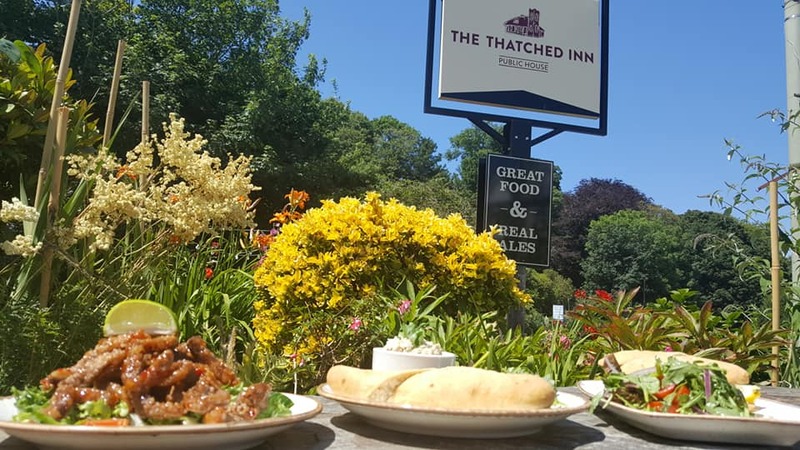 We love our food and drink at The Thatch and have recently been awarded Muddy Stilettos Best Destination Pub in Devon 2017 and in July we retained our Certificate of Excellence from Cask Masque for serving quality real ales. Dogs are welcome in the beer garden but not inside. A 6oz Exmoor beef burger with bacon and smoked applewood cheese. Our legendary burgers are made using delicious local Exmoor beef. All come served in a Deli Brioche bun, with homemade mayo relish, side salad and chips. We also serve a range of seasonal special dishes please call or see the blackboard in the pub for more information. Menu and prices subject to change subject to availability.